Social stability in Northwest China's Xinjiang Uyghur Autonomous Region has brought a tourism boom to the region in the winter, previously considered the low season, and governments at all levels in the region are ramping up efforts to develop the travel industry. The tourism market in Xinjiang skyrocketed in 2018, with the number of trips reaching 150 million, an increase of 40 percent over the previous year, according to data from the two sessions in Xinjiang. During the Spring Festival holiday last year, nearly 2.1 million trips were made to Xinjiang, and tourism revenue reached 1.688 billion yuan ($250 million), an increase of 46.86 percent from the previous year, according to Xinjiang's tourism authorities. Xinjiang's current efforts to eliminate extremism and to ensure social stability, including the establishment of vocational training and education centers, have contributed to the booming tourism, according to officials reached by the Global Times in Xinjiang. "Social stability and the unification of different ethnic groups in Xinjiang have helped with the quick development of tourism. More residents in Xinjiang have participated in the development and their income increased sharply," Pang Xiangyang, an official from the publicity department of Ili, told the Global Times. According to a work report of the Xinjiang government, the social stability benefits the development of tourism and the government is taking the opportunity to build Xinjiang as an important sightseeing destination, the Xinhua News Agency reported in January. Developing tourism can also help with poverty alleviation in Xinjiang. According to the Xinjiang Daily, the region has invested 172 million yuan in 263 tourist programs for poverty alleviation and helped provide jobs to 12,000 poor residents. Take Yueliangdi village in Mulei Kazak autonomous county as an example. A total of 78 of the 144 households in the village took part in local tourism development, and their income increased by 30,000 yuan from January to October 2018, while 40,000 trips were made to the village, the Xinjiang Daily reported. Moreover, governments at all levels in Xinjiang are ramping up efforts to promote winter tourism. 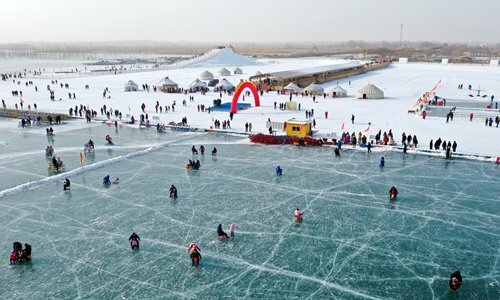 From December 2018 to April 2019, Xinjiang will hold 196 promotional activities to boost its winter tourism, including a Nadam Fair - a traditional festival of the Mongolian ethnic group - in Hejing county in the Bayinhgolin Mongolian autonomous prefecture, an ice engraving light show in Urumqi, and a musical gala in Xinyuan county in the Ili Kazak autonomous prefecture, chinanews.com reported. "In order to keep the momentum of tourism development in Ili, local government has launched cultural festivals, including promoting local delicacies, trade fairs, and winter swimming, skiing and horse racing competitions," Pang told the Global Times. According to data provided by Pang, a total of 5.66 million trips are expected to be made to Yining, a city in Ili, from October 2018 to April 2019, an increase of 46.33 percent over the previous year. Tourism income is expected to reach 6.944 billion yuan. Other areas in Xinjiang have also made efforts in developing the tourism industry. Sun Liang, a manager from Baiyun Ski Resort in Urumqi, was quoted by china.com.cn as saying that during the three-day New Year holiday, more than 10,000 visitors came to the ski resort. "We almost ran out of ski instructors!" said Sun. Xinjiang is also cooperating with media in different provinces to promote tourism. Xinjiang's cyber space administration launched a program with popular Chinese video-sharing app Douyin to invite users to live-stream their visits to Xinjiang. Wang Mengyun, who was born in Xinjiang and now studies in Helsinki, Finland, returned to Xinjiang and guided Tik Tok (Douyin's overseas edition) viewers on a virtual visit to the Tianshan Mountains and scenic spots along the Belt and Road route. Many netizens praised the program for displaying the gorgeous landscape and cultural relics of China's Xinjiang, and inspiring patriotism. Aside from improving promotional activities, Xinjiang has also sped up infrastructure construction to support tourism development. According to chinanews.com, all prefectures and cities in Xinjiang are now linked to the highway network, and 21 airports opened in 2018. Xinjiang launched a winter tourism train in 2018 to take passengers to the main scenic spots in the region, including Kanas in Altay prefecture, Wenquan in the Bortala Mongolian autonomous prefecture, and Kuqa in Aksu prefecture. Thanks to the rich tourism resources in Xinjiang, winter tourism has boomed and more efforts should be made to enhance support facilities for future development, a tourism industry insider in Xinjiang, who asked for anonymity, told the Global Times.